These beach rentals in Sanibel Harbour feature many bells and whistles. This beautiful corner unit has sunrise AND sunset views, large wrap-around screened-in balcony with plenty of seating. Views of the pool and Gulf, facing South towards Sanibel. New stainless steel appliances in kitchen, tray ceilings, tile in the kitchen and living room, newer furniture and accessories. Our vacation rentals are professionally designed. Comfortable mattresses in master and guest bedrooms, with a king in the master and two twins in the guest room. Tiled showers in both bathrooms. Washer and dryer in master bath instead of kitchen. Crown molding. 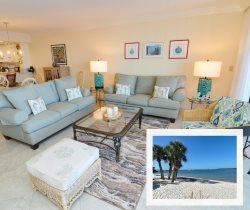 Read more about our Sanibel Harbour vacation rentals. You may have found this rental on HomeAway 4363884, HA ID 4363884, VRBO 4363884ha or Vacation Rentals 4363884. Amazing. Arrived at the condo building; walked into the condo; left 3 days later and never had to stand in a line to check-in or out. Convenient to have a variety of restaurants to choose from. This is simply THE BEST condo we have rented with you. We have stayed in several others over the years we have been coming to the resort and this one truly is a home from home! We have already booked for next year...thanks so much for helping to make our vacation so special! Extremely friendly; had a situation come up where we needed an extra hour past the 10:00 check-out time, and without hesitation gave us two hours. Our unit 1011 was beautifully decorated, and exceptionally clean (I am very picky about cleanliness). The view was gorgeous, as you could watch both the sunrise and sunset. We stayed over Memorial Day Weekend, and although other guests staying in our building were extremely loud and inconsiderate, it was easy to look beyond because of such accommodating staff, beautiful, well maintained grounds, and everything in our unit in top notch almost brand new shape. We will for sure book again. I was very impressed with the two people that helped me when j was looking to book a room at Harbour Resort Properties. I had never stayed there and until very recently had never heard about this property. I was treated with such kindness on the phone and I felt that the staff really cared about helping me; I will definitely be back and have already talked with my extended family about a large group of us coming and staying there. The views from the room were spectacular! I have already hinted to my husband that we need to start saving in order to buy a property here. We really enjoyed our stay here. Everyone we encountered from the staff to the other guests were all very friendly. This place is a hidden gem and we are already starting to talk about when we will be able to get back down there! Great staff you have there!